Here's how the attack mode emanate eggs work: they can have a whole host of offensive capabilities. Most common attack is to fire a laser beam. But, they can also shape-shift into miscellaneous close-combat weapons when needed. 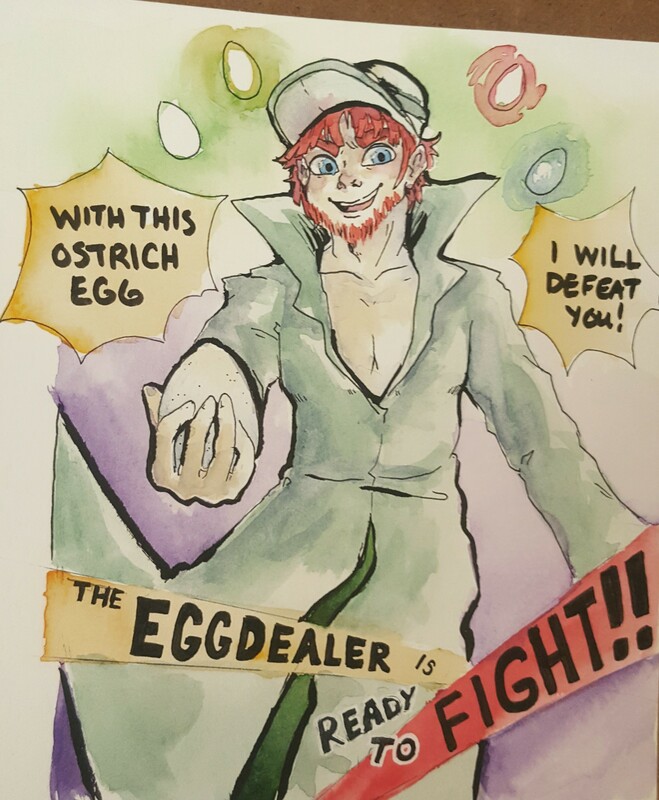 To get turned into an egg the opponent has to be hit by an emanate egg ability and have less willpower than the Egg Dealer, who is very strong willed. So it may take just one hit or more than one hit, it depends on the opponent. The egg gas is just a signal that the Egg Dealer is around and it emanates from his power. It has a unique, but pungent odor, and it's sort of like a fingerprint. Thank you for your comments! Here's how the attack mode emanate eggs work: they can have a whole host of offensive capabilities. Most common attack is to fire a laser beam. But, they can also shape-shift into miscellaneous close-combat weapons when needed. To get turned into an egg the opponent has to be hit by an emanate egg ability and have less willpower than the Egg Dealer, who is very strong willed. So it may take just one hit or more than one hit, it depends on the opponent. The egg gas is just a signal that the Egg Dealer is around and it emanates from his power. It has a unique, but pungent odor, and it's sort of like a fingerprint. This character has some seriously un-serious pontential. Ability-wise I could use some more detail about how the egg attacks work. What does it take to get you turned into an egg? Does he have to make you inhale egg-gas? Can he turn you with one touch from the attack eggs? Or is it based on some sort of spiritual strength gauge? Comic-wise this is a solid intro. Totally dig the silly shounen parody. I just wish it was hammered in beforehand that this was a generic hero rather than afterward. Heck he could have been an actual costumed hero, just to show Egg Dealer's power through defeat! Finally some of the action was confusing, like top of pg 3 looks like eggdealer's eye belongs to the shadowy-figure. I think a behind-the-head shot would have been better for that panel. This character has some seriously un-serious pontential. Ability-wise I could use some more detail about how the egg attacks work. What does it take to get you turned into an egg? Does he have to make you inhale egg-gas? Can he turn you with one touch from the attack eggs? Or is it based on some sort of spiritual strength gauge? Comic-wise this is a solid intro. Totally dig the silly shounen parody. I just wish it was hammered in beforehand that this was a generic hero rather than afterward. Heck he could have been an actual costumed hero, just to show Egg Dealer's power through defeat! Finally some of the action was confusing, like top of pg 3 looks like eggdealer's eye belongs to the shadowy-figure. I think a behind-the-head shot would have been better for that panel. This is the craziest concept and character theme, but I'm here for it. Welcome aboard! that right out of the gate! I really appreciate it. Thank you everyone for such a warm welcome. And thanks yarnwitch for the beautiful fanart, I wasn't expecting something like that right out of the gate! I really appreciate it. I love this! Have a fanart! [img]https://cdn.discordapp.com/attachments/361619017636511747/466825438543740948/20180712_003355-01.jpg[/img] I love this! Have a fanart! You have eggs. I have a bird-shaped friend. This match was written in the stars. You have eggs. I have a bird-shaped friend. This match was written in the stars. Fight me as well please! This is weird and I like it. wELCOME HAPPY TO HAVE YOU FRIEND!!! !